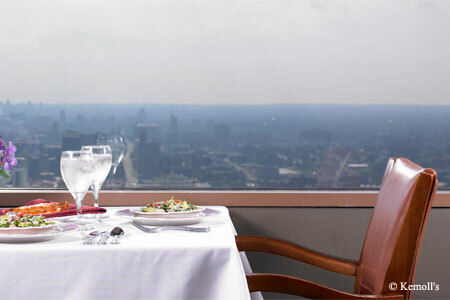 One of St. Louis' oldest restaurants, Kemoll's continues to deliver traditional Italian food --- with a view. : Kemoll’s is well into its fourth generation of family members preserving its founders’ recipes and standard for hospitality. The three-direction views from its home on the 40th floor of Metropolitan Square heighten what is already a lovely fine dining experience. Kemoll’s draws traveling business types as well as St. Louisans out for a celebratory round of fried artichokes or calzone (two of the restaurant’s original recipes). We suggest the seafood preparations --- let broiled South African lobster tails with an appetizer of calamari fritti set the tone --- or one of the six variations on veal. Another standout dish is filet mignon in a peppercorn-cream sauce. Servings are huge, even when it comes to classic desserts like tiramisu. Service is surprisingly casual, making this a good choice for those apprehensive about asking a formal waitstaff for help navigating a wine list, like the extensive one Kemoll’s offers.